The Altra Superior is a shoe that I fell in love with after the release of the Superior 2.0, and it’s a shoe that I’ve always felt is about 80% developed to its potential. With its historically moderate stack height (18mm), dialed-in fit, and gloriously roomy Altra toebox, this has always been my favorite model in the Altra arsenal. Added-in bonuses of the Superior include a removable rock plate that lives underneath the insole and overall flexibility that has stayed true to the model’s minimalist, zero-drop roots. Where I’ve always struggled with this shoe is over the longer distances. I think of the Superior as a 50k shoe, and that is pushing it on rougher trails. The smooth, comfortable, and minimalist feel of past Superior models always feels perfect to about 15 miles and then I’ve found myself wishing for something a bit more cushioned on my feet. So, cue the Altra Lone Peak. With a slightly thicker, 20mm stack height, the Lone Peak has always been the comfy, a-little-sloppy, sofa-feeling bigger brother to the Superior. However, this is not the case anymore. 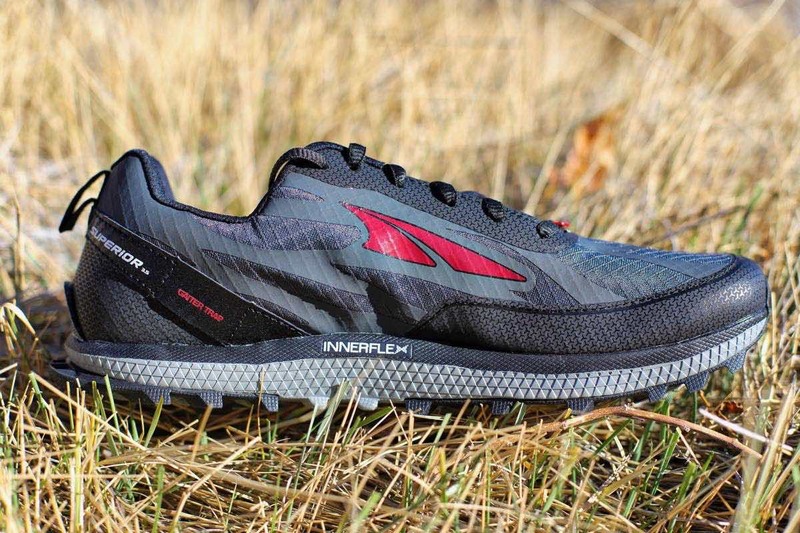 The Altra Superior 3.5 ($110) gets reinforcements throughout the upper and a slightly thicker stack height to become the best-possible version of the Lone Peak ever made. With this review of the beefed-up version of the Superior, my aim is to tell you what I like about it, but also what makes this version of the Superior a bit of a diversion from its heritage. A first glance, the updated upper of the Superior doesn’t seem to differ much from the 3.0, and you would be absolutely right. 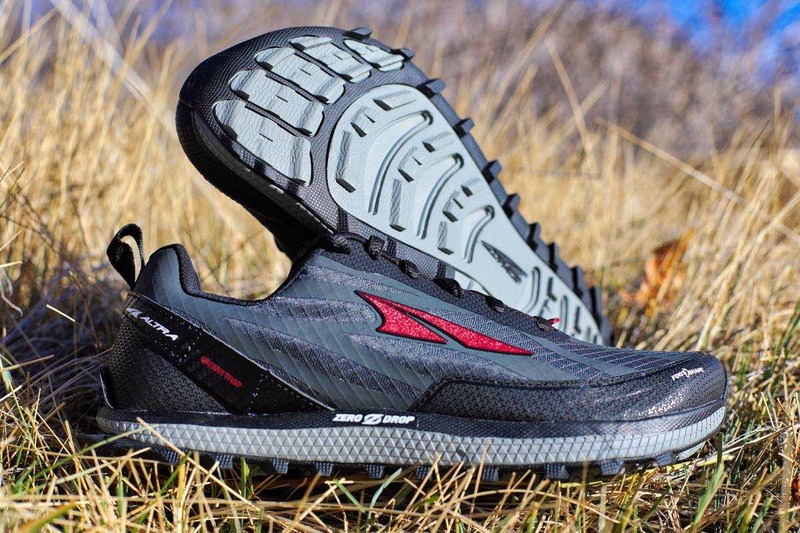 Altra continues to employ what works in this upper, including a robust but not rigid toe bumper that extends around the sides of the foot into the rand of the shoe. Additionally, welded overlays web out from the lacing system in all the right places so as to not cause irritation at the sides of the foot on sensitive pinky toes or bunions, and the exact same heel cup/ gaiter trap design is used. While there are only a few small upper changes made from the Superior 3.0 to the 3.5, they are significant. 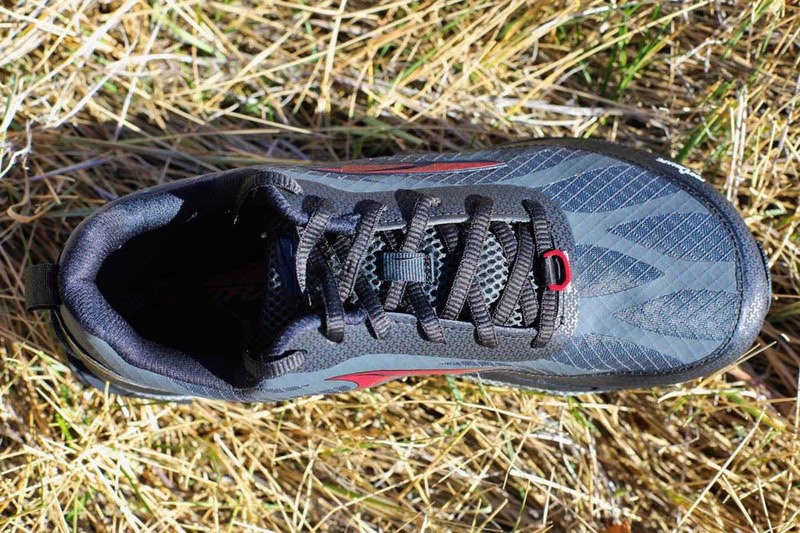 Altra uses sausage laces on the update, which decrease pressure on the top of the foot, and a gaiter-attachment loop is placed at the toebox. These minor changes pale in comparison to what truly makes this shoe a winner, which is a slightly deeper toebox. While the Superior 3.0 had plenty of room for toe splay, the shoe was a bit constricting with its shallow toebox that extended through the midfoot and placed an undo amount of pressure throughout the top of the foot. With this updated fit, the Superior 3.5 becomes the best-fitting Altra shoe ever designed, in my opinion, as it can handle swelling from an ultramarathon as well as feeling locked down enough through the midfoot for technical and off-camber trails. While the fit of the Superior is vastly improved with this version, there are still some issues with this upper. Like many trail-shoe manufacturers, Altra has made the upper on the Superior more durable than ever to deal with complaints of blowouts. The Quick-Dry Air Mesh of the Superior 3.5 is certainly durable, and I’d say that it dries at an average rate compared to most trail shoes. However, this upper is hot, and even while testing this shoe during a Colorado fall and winter, whenever it got above 60 degrees Fahrenheit, I felt like my feet were sweating significantly. This was evidenced by the salt deposits I left all over the uppers on this shoe. Additionally, I experienced some irritation during my first few runs where the underside of the tongue is sewn into the toebox, and this caused some hot spots and rubbed the skin away on my second- and third-toe junctions. A simple examination of the 3.0 and 3.5 reveals a much softer fabric against the top of the foot in the 3.0. Strangely enough, this issue only bothered me during the first two runs in the Superior 3.5, and it never bothered me again. For the record, I typically have worn Drymax Lite Trail Run socks during my testing period. Altra retains the excellent feel of the Superior midsole with this version while beefing it up a whole 1mm. One may ask, “Can you feel 1mm of midsole?” Well, I certainly can, and I appreciate this 19mm, zero-drop midsole more than ever. This is the first version of the Superior that I could imagine wearing for a 50 miler with my geriatric feet. The dual-layer midsole is great for faster running and the Superior 3.5 certainly does not feel like a 10.8-ounce shoe. Added in is the removable rock plate (1 ounce on its own), which offers just enough protection for most trail surfaces, but not enough in my opinion, for technical trails with a lot of sharp and jagged rocks. As always, Altra uses a zero drop from the heel to the toe of the shoe, and the 3.5 seems less rockered than past versions. Whether or not you, individually, can handle a zero-drop shoe over the long haul seems to be completely subjective. I’ve known runners who will take months to transition to zero drop and they still struggle with sore and cramping calves. Alternately, I seem to be able to transition between 0mm and 6mm drops without issue. I will say that I do notice a significant tax on the ancillary small muscles around my ankles and lower calves. This seems to happen in all Altras that I wear, especially when I transition into longer runs. I do wear zero-drop shoes casually and to work, so it’s not a transition issue. While I understand the purpose of zero drop, a wise friend of mine said it best, “Altra would basically take over the trail running market if they offered their shoes in 4mm and 8mm drops.” I completely agree with him. Again, I feel the need to emphasize how locked down the fit is in comparison to other Altra trail shoes such as the Timp and the Lone Peak. With the Superior 3.5, I feel like I bomb down a hill without my foot sliding forward or having the insole bunch up in the shoe. The Altra Superior 3.5 medial upper. This is an area that I feel like really needs attention prior to the next Superior upgrade. Altra’s DuraTread Rubber with TrailClaw outsole is designed to be soft and sticky in the middle with a harder, carbon rubber outsole around the exterior. This interior rubber, while sticky, is much too soft, and I feel like its showing some premature wear. I also felt like the soft durometer of this outsole rubber allowed pointy rocks to poke my feet a few too many times, especially while running downhill. With the soft and springy feel of Altra’s A-Bound Blend midsole, one could expect that a hard and durable outsole would be a nice compliment to really grab the terrain. Also, for the love of all that is holy, get rid of the Trail Rudder. I think it has been a nice aesthetic nod, but it is completely non-functional. I know this because I’ve cut off the trail rudder in most of the Altra shoes I’ve worn over the past several years, and I don’t notice any difference in running downhill. Getting rid of the Trail Rudder saves weight and keeps little pebbles from getting flipped up into shoes. The Altra Superior 3.5 outsole. I put over 200 miles on this shoe in an attempt to really grasp why or why I wouldn’t chose this shoe for an ultra. 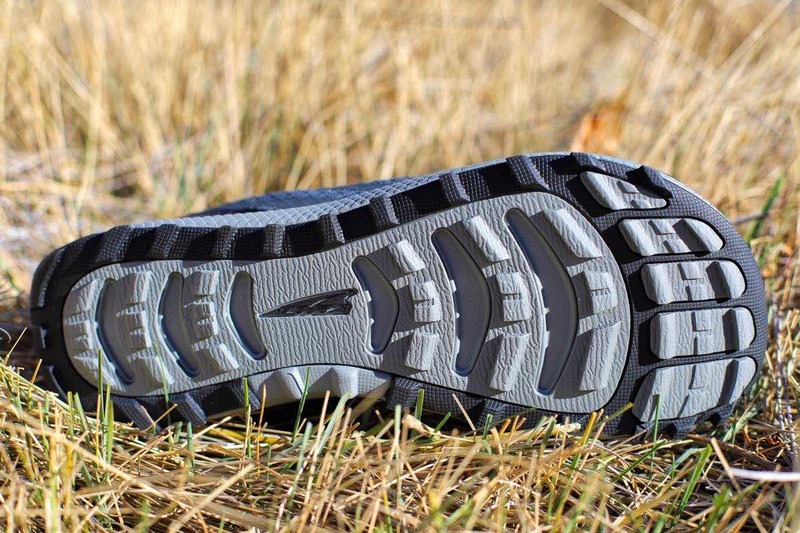 Essentially, what I came away with is that the Altra Superior 3.5 is the best Altra Lone Peak ever designed. Altra has chosen to abandon the spry and airy feel of Superiors past in favor of a beefed-up, long-haul comfort monger that will be a great shoe for any runner who can handle zero drop for the duration of an ultra. The Superior 3.5 became a daily trainer that I really enjoyed for about the first six miles of every run, but then I did notice additional fatigue hampering a lot of the small muscle groups around my ankles and calves, especially while going up steep hills. While one could argue that my feet and calves are just not strong enough in those areas, I would argue back that this phenomenon doesn’t happen if I wear a shoe with a 4mm drop. 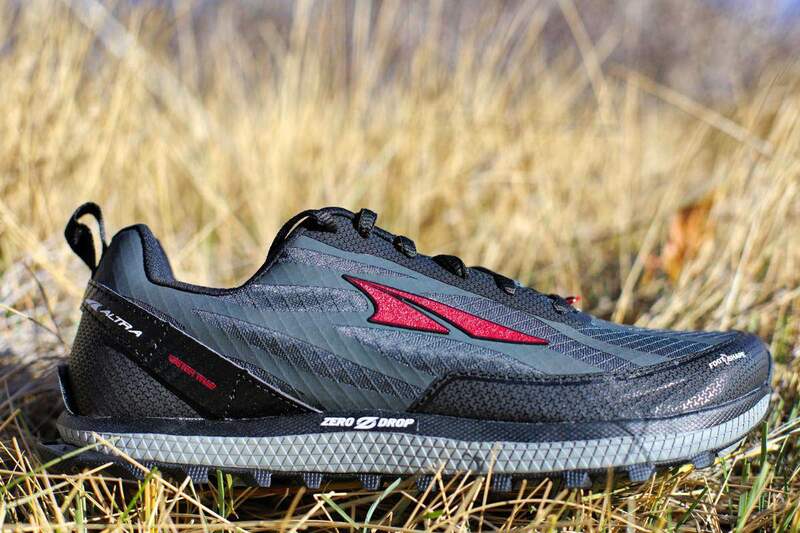 If you are a fan of the recent iterations of Altra Lone Peaks, I would urge you to try the Superior 3.5. The fit is absolutely phenomenal, the upper is as durable as they come, and the midsole and removable rock plate are beefed up just enough to handle ultra distances. However, if you’re looking for a lighter Altra consistent with the heritage of the original Superior, then you’ll have to look somewhere else. This Superior 3.5 is now heavier than the Lone Peak 3.5, and while I feel that the fit is superior in the Superior, the added weight seems and feels unnecessary. Lets start with getting rid of that Trail Rudder. Are you running in the Altra Superior 3.5? What do you think of the shoe overall? If you’ve run in previous versions of the Superior, what are your thoughts on the updates in version 3.5? The Altra Superior 3.5 view from the top. The Altra Web site specs list the weight as 9.6 ounce. Otherwise great review. I appreciate the clarification, but I’m not buying that weight from Altra. I used to bring shoes to work and use the mail scale to weigh them, and it always matched up with runningwarehouse.com info better than the manufacturer. The manufacturers may base those specs on prototypes, but during manufacturing they change. The Superior 3.5 is not a light weight shoe, thats why I compared it more to the Lone Peak rather than the Superior heritage. Altra are incredible shoes. I’ve used both Superior and Lone Peak versions. Superior for up to 50k, and Lone Peak for distances over 50k. Yes, the outsoles wear quicker than some other brands. Not to worry – they transition in my fleet to becoming my road shoes as the lugs wear out! My current Lone Peaks have over 1,000 miles on them. That is not a typo. Uppers are great still. Midsole is pretty much compressed, collapsed, and good for not much. Outsole is smooth as a baby’s hind end. In a few places, the outsole is now gone, and the midsole is exposed. I still love them! But this review is making me want to take a trip to my local running store today. (It helps that I work 1/8th of a mile from the Charlotte Ultra-Running store…!) It sounds like they cross-bred the Superior and the Lone Peak. I’m looking forward to testing out this newfangled Supeakior. Agreed on the cross breed of the Lone Peak and Superior feel. I’ve never been able to wear a Superior for over about 20 miles on rough terrain, and with the 3.5 I’d wear for 50 miles (if I can figure out that weird heel soreness that I get with this shoe). I read somewhere that Altra is standardizing the drops for their 2018 line at 20-Superior, 24-Lone Peak, 28-Timp, and 32- Olympus. I did look at, but didn’t try on, the Lone Peak 4.0 at Outdoor Retailer and it felt burlier in my opinion, from the outsole to the overlays. The weight is reportedly 10.2, but with the Superior 3.5 weighing more, my guess is that the Lone Peak 4 will ultimately weigh more as well. Again, I don’t have the final specs. Otherwise, I like your style and philosophy on turning trail shoes into road shoes! – Sizing: With the longer toebox, I had to go a half size down from what I wore in the 3.0 (10 in 3.0, to a 9.5 in the 3.5). My old 3.0 size was simply too long. – Width: The toebox definitely feels narrower. This is probably related to having to go down a half-size. Not uncomfortable, but I definitely don’t get that nice “toe splay” feel that I did with the old 3.0. I think over time they will stretch out, but out of the box they sqeeze the forefoot. -Break-in: I thought the 3.0s ran great out of the box and were fully broken-in after only about 20 miles. The 3.5’s still have that “not quite broken in” feel after 40 miles. So with the durability and increased stack comes a longer break-in period. -Ground feel: I don’t really notice the extra 1mm in stack height, but I do notice a slight decrease in ground-feel comparted to the old models. Maybe they just need more break-in. **Note: if traction isn’t an issue on your trails, try the new One V3. Much lighter than the superior 3.5, and similar ground-feel and flex to the old 3.0s. They’re marketed as a road shoe, but IMO they make a great fireroad or non-technical trail shoe. Thanks for the great feedback. Its always great to read how other runners are feeling about a shoe. I wanted to add some feedback after my longest run in the Superior 3.5 to date which happened this past weekend after I’d already completed my review. -The midsole protection, with the rockplate in, felt adequate for the entire run. -The outsole grip was poor on the loose and rocky downhills, and I slid out multiple times. This outsole does not inspire confidence on the steep and loose dry stuff. Felt like I was running on marbles. Note that I did cut off the trail rudder over a month ago which made no difference as I’m a midfoot striker. -At the end of the run, and especially after the run, I had a lot of heel pain and discomfort around my heel. This wasn’t an achilles issue, and I didn’t have especially sore calves over the next few days. Oddly, I didn’t have any issues running in the Altra Timp or Paradigm later in the week. I feel like it only happens in the Superior 3.5? Any suggestions? I like the Altra fit, but the weight is off-putting. They don’t seem to have any trail options under 10oz anymore. I’m running in the King MT 1.5 right now. I’m seeing a lot of discrepancy around the weight of this shoe in a men’s size 9, and I don’t believe Altra’s website that it is 8.4 ounces. Runningwarehouse, which has always been more accurate IMO, lists the King MT 1.5 at 10.4 ounces which really isn’t helping much in weight reduction. The King MT feels more spry, and the traction is great. I even like the strap which I thought was gimmicky, but it does provide a better forefoot fit. The strange thing is that Altra’s road shoes are light and airy, especially the new models, while trail shoes continue to get heavier. I’m assuming this is due to the history of complaints about durability issues with the uppers? I haven’t had any durability issues with Altras for the past three years. Nice review, I disagree on the trail rudder. Makes a big difference to me running fast downhill. I’m really excited the Lone Peak 4 has the rudder back. I run in the Superior 3, Lonepeak 3.5 , Olympus 2.5 and Torin 2.5. Always excited to see what new things Altra has coming. Reading between the lines (heavier, hotter, beefier, adding more gimmicks to a shoe beloved for not having many), this sounds like Altra is taking the Superior directly away from what I liked about it. Like Chris, I’d love to hear more options about any manufacturers trail shoes that still fit in the lightweight low drop category. Also, Altra: any chance you’ll add a lighter, lower stack shoe to the line to compliment the Superior / Lone Peak / Timp set? I’ve put just over 100 miles in Topo Athletic’s Runventure 2, and they might be what you are looking for. 19mm stack, 0 drop, 9.2 oz, forefoot rock plate. I haven’t noticed any premature wear on the uppers, but I wouldn’t want to take them on talus/scree or trails where the upper is going to see major abrasion (something heavier would work better). They handle moderately rocky trails just fine for me though, and they feel good and fast! I didn’t see your comment as we were both commenting to Eric at the same time. Pretty funny that we both came to the same conclusion. I have a review of the Runventure 2 forthcoming! Hi Tom and Aaron – Thanks for the heads up about the Top Runventure! I looks really interesting. Don’t get me wrong, I wouldn’t say there are really any added gimmicks to the shoe. I thought the Superior 3.0 was pretty much perfect, though I would have liked a bit deeper toebox (height wise). The 3.5 is heavier, hotter, beefier, and more durable. I really have trouble with the amount of reviews that I read online about Altras that talk about blowing the sides out of the shoe within 100, or ripping off lugs after 50 miles, etc… Altra seems to be responding by making everything more durable, but again, I’ve never had an issue with premature wear on any of the recent Altra releases. If you’re looking for a zero drop, minimalist shoe with a nice foot shaped toebox, check out the Topo Runventure 2. They went zero drop with this shoe and while it does have the protection of the Superior, it is very lightweight and spry. Your stack heights are listed wrong. 21mm stack for the Superior and that hasn’t changed from the previous model. The Lone Peak is a 25mm stack height. Also Altra’s entire brand is based off of Zero Drop. Shoes with heels are not healthy. The reason you feel those muscles more in Zero Drop shoes is because they are loading and engaging properly, which is necessary and healthy and something raised heel shoes don’t allow you to do naturally. Five (?) years in Altra. Olympus, Superiors x five, Lone speak. Five ultras with four 50 mile runs. Sup 2.0 were great. 2.5 I don’t know, 3.0 are great! Sides wear out on 2.0, Lone Peaks have been great. Lugs have worn and cushion goes away in about four hundred miles. I haven’t been able to wear anything else due to my neuroma. Wide toe box rules for me. Zero drop philosophy works for me. Hundie coming up. Maybe I’ll wear three different pair over 100 miles. I am still on the 3.0 with a slightly different upper but I find it difficult to believe that this shoe can be hot. These are super breathable and my socks get wet if I happen to walk on moist grass! Although I completely agree on the outsole, it really need a redesign to handle loose and technical terrain. Running on a granite trail it literally feels like I’m in marbles. And rocky trails give my feet a pounding, especially from pointy rocks. Weight… I feel that these are very light shoes overall but they only feel “heavy” when I compare them to my pair of Sense 6 SG, which isn’t fair. Maybe the same comparison applies to the traction, apples and oranges. Love the review. I have been wanting to try Altras for years but have been a little wary of the zero drop thing. Based on your comments in the review regarding getting used to the feel, do you think that its wise to have a second pair of daily trainers while trying to get used to the zero drop platform? I haven’t really heard anyone speak to this, but I only hear glowing comments about Altras. Would it matter to go with something like the Olympus or Lone Peak over the Superior for a first time Altra user? Thanks! I rarely run in any shoes over 8mm drop, and my sweet spot is 4-6mm. I’ve done an experiment recently that I should have done prior to this review. I ran only in various Altra models for two weeks (Timp, Duo, Superior 3.5, Paradigm 3) and it is only after running in the Superior 3.5s that I get sore heels and very sore calves. It could be the instability of the shoe. Yesterday, on a planned 20 miler on technical trails, I abandoned the run 16 miles in after a sharp rock got me in a soft spot on my foot. I really think that the Superior could benefit from a harder outsole. As far as transitioning, everyone is different. I would go slow and make sure to really stretch out and rehab your calves. But, in four years of doing a lot of running in Altras, I’ve never had the current problem I’m experiencing with the Superior 3.5. Cut the rudders off. You won’t miss them, or the sand and dirt that flips up into your shorts. I agree about the lack of breathability. Lone Peak 3.5 is also less breathable than verion 3.0. The rubbing between the 2nd and 3rd toe at of the base of the toe happened to me in the lone peak 3.0s on the right foot specifically. I didn’t experience the issue in 3.5s. I’m curious if the the superior would do it to me. It was very annoying and painful. Had to use kt tape often. I loved this review. I agree 100% with your assessment of the Superiors (and zero drop) being just a bit too much for the really long runs. More than a half-marathon, I’d want more cushion and a little relief for my geriatric feet as well. I like Brooks Pure Grits for the 4mm drop and the insole arch helps, but the traction is limited and deadly on damp rocks. This Superios 3.5 sounds great, but my real question is: How do the heels hold up? I love all my Altra running shoes (road and trail) but every single pair ends up with holes on the inside of the heels. My son’s shoes did the same and I’ve read and seen others who have had the same problem. I bought the womens versions in Superiors and Escalantes in size 12 which fit me and the heel fits better and wears a little better, but still breaks down in the long run. In the men’s shoes, I’m getting about 150 miles before the heels start to wear holes. Thanks for a great review. As noted in some other some other comments, Altra really needs to get some lower weight models out there. I’ve transitioned to Altra because my feet don’t fit in “standard” toe boxes, but it pains me to see how heavy all their trail shoes are. I’ve been using Salomon S-Lab Sense 6 SG, which I think is quite comparable with 21/17mm sole vs 19/19 for Superior 3.5. But the Salomons are 2.9 oz/84 g lighter, which is insane. The Salomons were absolutely fantastic for mountain trail running here in Sweden, but they’re just too narrow for me. Just found this review…. and gotta say it hasn’t helped me decide. Currently run in saucony peregrines. Love em, but want to go back to altra / zero drop. I like longer trail runs, often tough terrain and I can’t tell here if I should be looking at lone peaks or superiors. Love the Superiors however, the durability is the worst I’ve ever had in a shoe. The inside heel wore though in less than a month and the outside stitching came apart on the outer portion. It’s the most comfortable shoe I’ve worn but I just emailed Altra to give them my feedback! Hi, anyone could chime on their sizing? Im 8.5 on Kings 1.5, 9 on LP3.5 and 8.5 on LP4. What size should i get for the Superior 3.5? I would go 8.5 as these are similar to the King MT and LP4 in sizing.